Hal Haydel was born on Sunday, July 9, 1944, in Houma, Louisiana. 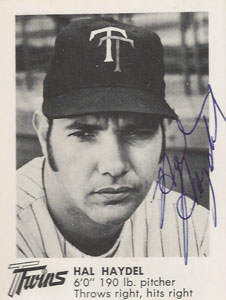 Haydel was 26 years old when he broke into the big leagues on September 7, 1970, with the Minnesota Twins. His biographical data, year-by-year hitting stats, fielding stats, pitching stats (where applicable), career totals, uniform numbers, salary data and miscellaneous items-of-interest are presented by Baseball Almanac on this comprehensive Hal Haydel baseball stats page. John Harold Haydel was a Major League Baseball player who pitched for the Minnesota Twins ( 1970 - 1971 ). Hal, his nickname, was originally signed by the Milwaukee Braves , in 1962, and became the first St. Francis de Sales High School player to appear in the majors. 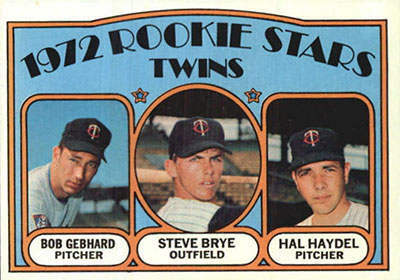 Did you know that after Hal Haydel had four cups of coffee in 1970 (won 2, lost 0), then appeared in thirty-one games in 1971 (won 4, lost 2), Topps put him on his first baseball card, a 1972 Topps Rookie Stars , alongside Bob Gebhard and Steve Brye ?